Samsung may skip OLED to focus on QLED TVs | What Hi-Fi? Reports suggest the biggest TV manufacturer in the world may never actually make an OLED TV, instead choosing to focus on quantum dot technology. Samsung made plenty of noise at CES at the start of the year but in terms of Samsung TVs, it was arguably a touch quiet. 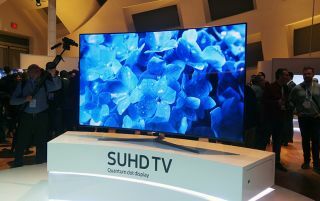 There were new Samsung 4K TVs, led by the flagship 65KS9500, but there was still no sign of a Samsung OLED. Instead the focus was on quantum dot - and now it looks like Samsung may be set to skip OLED altogether in favour of the next step in quantum dot technology, QLED. ET News in Korea reports a "high-ranking" Samsung official, who claims the company is now planning on skipping straight to QLED: "Although we had been developing and paying careful attention to OLED technologies, there are problems regarding age and production cost with large products since they use organic material. VD Business Department is making a new roadmap for next-generation TVs,” says the employee. The key issues with OLED remain the high production cost, low yield (the number of screens manufactured that are good enough to use) and so-so durability. QLED screens, which remove the need for an LCD panel and instead create a picture using the quantum dots, are likely to be cheaper and longer-lasting - and could, ultimately, deliver a better picture. But all this won't be any time soon. Samsung's SUHD quantum dot displays were only released this year and it's expected to be a few years before QLED is sufficiently developed and ready for mass production. However, it is looking increasingly possible that we won't see any Samsung OLED TVs, potentially leaving rival LG to rule the OLED TV roost. MORE: What is QLED TV?